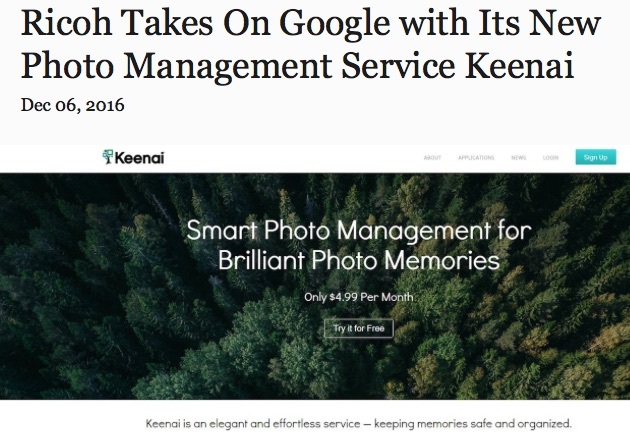 ZingPR client Ricoh Innovations is in the news today with the launch of its very cool photo-management app: Keenai. Early assessments by technology and photography journalists have been excellent, with coverage so far in PetaPixel, DPReview, Resource Magazine, Digital Trends, and others. Keenai automates the most tedious part of being a photographer: centralizing and managing your photos and videos. Keenai’s intelligent solution eliminates the frustration of managing photos and videos from different devices, and makes enjoying and sharing digital memories a simple and pleasant experience. CUPERTINO, Calif.—December 6, 2016: Ricoh Innovations Corp. (RIC), a Silicon Valley-headquartered subsidiary of Ricoh Company, Ltd., has launched Keenai, a smart photo-management service that keeps digital memories safe and organized. Available immediately in eight languages on all popular platforms (macOS™, Windows®, Android®, iOS™ and Windows Phone®), Keenai is the only photo service that connects all your devices and cameras, and unifies all your photos and videos for viewing and sharing on any device. 1. Automatic cloud backup of unlimited, original-resolution photos and videos. Users can store an unlimited number of original photos (including RAW) and up to 300 15-minute videos per month in the Keenai service. 2. Syncs collections of photos and videos so they can be enjoyed on all your devices. Keenai lets you bring your entire photo collection with you, wherever you go — online or offline. Keenai’s smart syncing keeps the originals safe in the cloud, and stores only device-friendly resolutions on your local device. 3. Bring your adventures to life as mixed-media experiences for family and friends. Keenai provides sharing of stories as gorgeous albums that combine photos, videos and even 360° images. Albums can be privately shared with friends and family via email or shared links, and accessed via any web browser. 4. Automatic image recognition and smart tagging for fast photo search. Keenai’s intelligent suite of applications does all the tedious tagging work for you, and makes enjoying and sharing your memories a simple and pleasant experience, every step of the way. 1. Keenai Web Application: Create your account at www.keenai.com. No download required. After creating your account, simply visit app.keenai.com in your favorite browser for easy access to all your original-resolution photos and videos. You can upload and download photos and videos via the web application, and use intelligent tools like Smart Views and Discover dashboards. 2. Keenai Mobile Applications: Use Keenai mobile applications to transfer images directly from your camera to your device, or upload photos directly to the cloud from your smart phone. Your entire collection is instantly synced with the cloud and can be browsed on all your devices – even later when you’re offline. Download here. 3. Keenai Desktop Applications: Use the Keenai desktop utilities to upload photos and videos from your desktop collection to Keenai. You can also set up a folder to automatically sync your original resolution photos from the Keenai service to your desktop or networked drive. Download here. Headquartered in California’s Silicon Valley with a subsidiary in Bangalore, India, Ricoh Innovations Corporation (RIC) creates new, global businesses based on advanced information technology for Ricoh Company, Ltd. RIC brings together world-class user experience, technology and business professionals to deliver easy-to-use, technology-differentiated Smart Vision and healthcare solutions to the market. Internal innovation is complemented by Open Innovation projects with a broad range of leading universities and forward-thinking companies around the world. To learn more about Ricoh Innovations Corporation, visit ric.ricoh.com. Ricoh is a global technology company that has been transforming the way people work for more than 80 years. Under its corporate tagline — imagine. change. — Ricoh continues to empower companies and individuals with services and technologies that inspire innovation, enhance sustainability, and boost business growth. These include document management systems, IT services, production print solutions, visual communications systems, digital cameras, and industrial systems. Headquartered in Tokyo, Ricoh Group operates in approximately 200 countries and regions. In the financial year ending March 2016, Ricoh Group had worldwide sales of 2,209 billion yen (approx. 19.6 billion USD). To learn more about Ricoh, visit www.ricoh.com.